We had a good few cancellations which made us feel like there was a little bit of injustice in the world after buying our ingredients and had been prepping 2 days and nights before. We wanted everything to be on time. 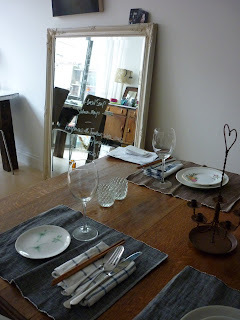 I found out that despite being very tired and exhausted from our day work as well as our new Supper Club venture, Simon and I are excellent at co ordination and organising. Our love for this supper club meant that we put everything else in our lives just a little to the left and we paid the utmost attention to every detail on getting the menu correct and to make the evening fantastic. 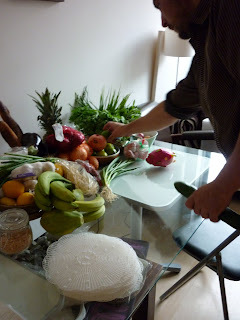 When our guests arrived (a mixture of friends and people we found on Twitter – who were lovely!!). We welcomed them with Rice Wine and a refreshing cocktail of Sweet Basil Seed Drink With Seaweed Jelly. It was a good icebreaker. I knew that no one would have had this before. 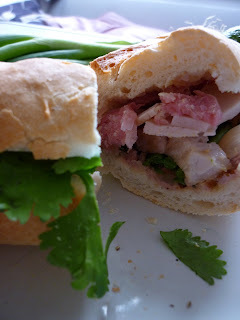 It is a Vietnamese Entree to seduce hunger and quenches it at the same time. Some loved it and some were clearly, bemused. But that was the point. As the plates and bowls went out and the diners were entranced by our lovely food and each other’s company, we heard roars and roars of laughter. People kept coming to say hi to us in the kitchen as well as talking to each other, finding out there there were 3 people in the room who can make prosthetic limbs, one can make explosives, one takes money from the rich to help the poor in developing countries and whatever else! Despite there being 9 courses or so, everybody ate everything. Only one didn’t eat the beef from the Pho because she doesn’t eat red meat. The frogs legs were a great talking point (it went well with the Sweet Basil Seed Drink – as they actually look like little tadpoles). We always bring one big platter to share between a table so people have to interact with others, just like when you come round for dinner. Everybody bought massive smiles to our faces and the compliments kept coming. 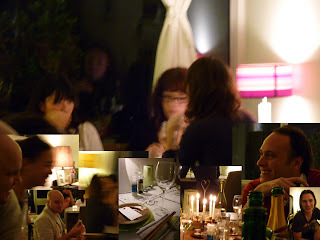 We joined our guests for dessert and bought wine, beer, sake, gin (whatever we had) to our guests and half of them stayed up with us til 6am – mainly laughing and talking about all sorts of funny business. Even our next door neighbours joined in. It was brilliant! Wow, your vietnamese dinner looks more like a great feast! Well done. I can't wait until the 4th December. The pics are great particularly the one of the pho.